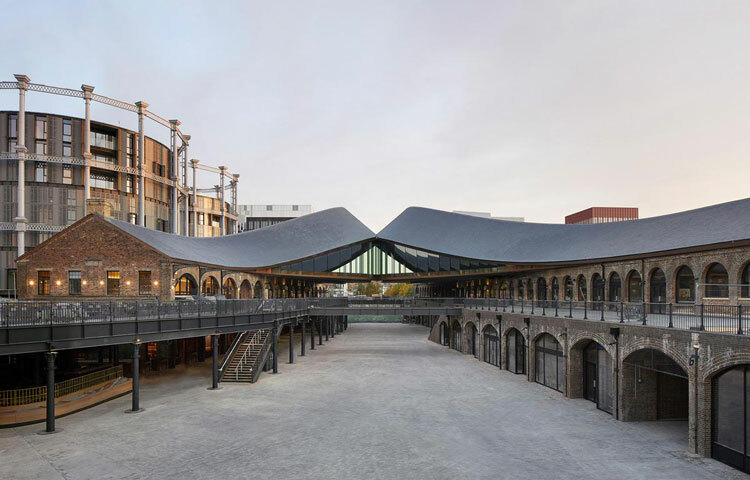 A new retail destination created inside two railway buildings in King’s Cross, London by Heatherwick Studio opens to the public today. The historic buildings, which date back to the 1850s, were used to receive coal transported to the capital from the north of England and were later used as warehouses and nightclubs – but they had become dilapidated over time. Now the buildings have been transformed into a new shopping district and public space by the studio for developers Argent. 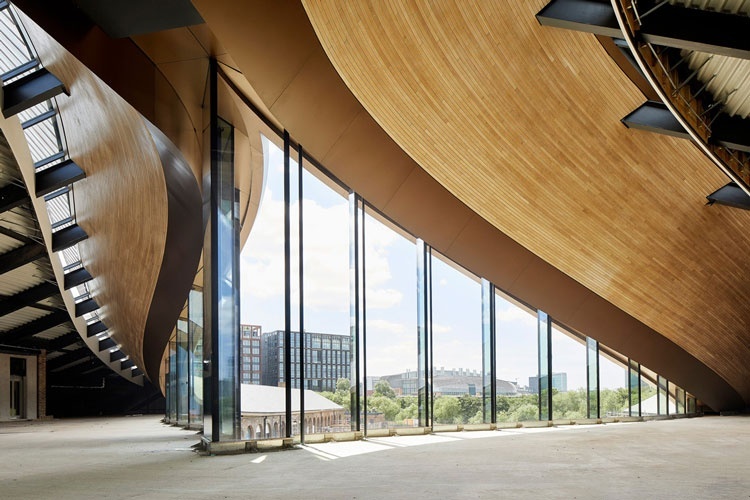 Heatherwick Studio has connected the two buildings with a striking design that sees the roofs lift and connect in the space between them. The new link creates an additional storey and a covered outdoor area, while also creating fluid circulation patterns, defining the yard and creating a central focus for the site, according to the studio. It features glass panels that let people see out and roof tiles that match those in the historic structure. 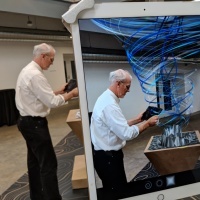 The designer says that the “human experience” was at the core of the project, as at a time when most things could be done online without leaving the house, “to be with your fellow humans is more precious than ever”. He adds: “We were thinking how could we make something that isn’t like a shopping mall, which is an enclosed thing with limited entrances. 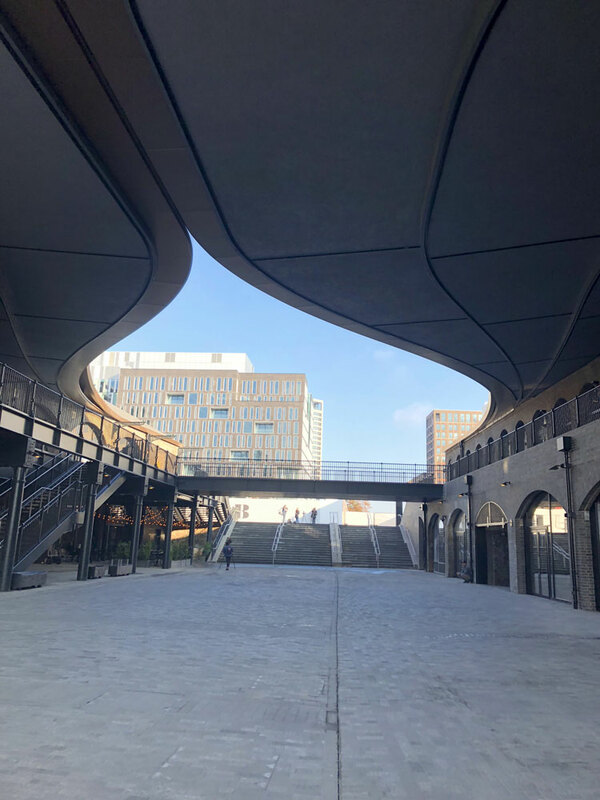 Tamsin Green, project leader at Heatherwick Studio says: “It was about responding to the challenges that we saw with converting these industrial buildings into a place where people could circulate. As well as large scale endeavours, such as replacing much of the roof as parts had “burnt out” in the 1970s, Green says, they were passionate about smaller scale “craftsmanship”. Examples of this include individually-designed bronze-cast buttons for lifts to add “a moment of surprise”. Working with existing historic structures and materials including iron, brick, slate and timber, the project aims to bring old and new together, as Heatherwick says it is important to “keep finding new languages” for working with historic buildings. Most shop units are situated in the arches, some within the original coal drops with fronts looking into the cobbled courtyard. With around 60 units ranging from 15m² up to around 2000 m², the project aims to encourage diversity in the types of businesses it can house, which includes shops, bars and restaurants. Heatherwick says: “There are thousands of students here, as well as people who live close by, people who are working and visiting and the international dimension. 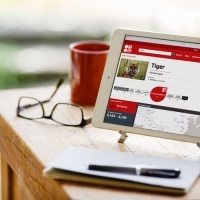 Businesses range from well-known brands such as Cos and Paul Smith, to lesser known independents and those just starting out. 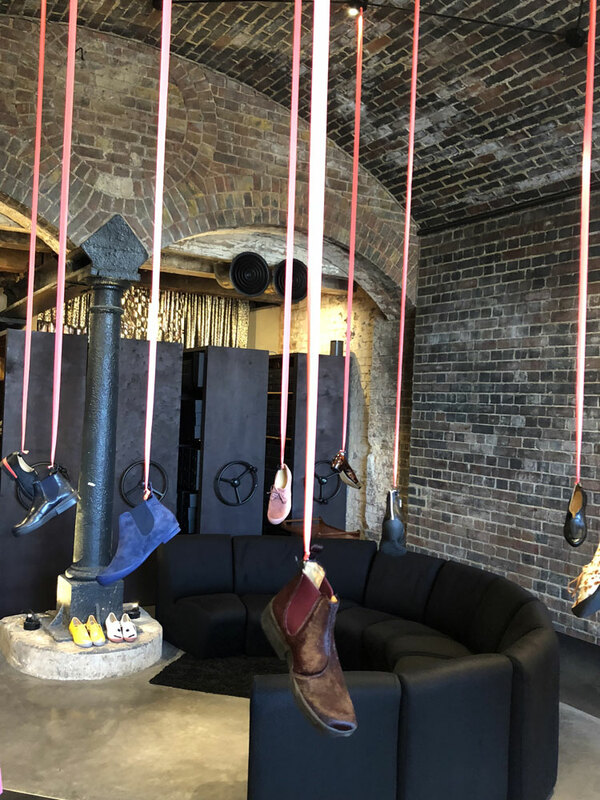 Retailers were able to design the interiors of their own units, some working with design studios and others taking the process into their own hands, with many incorporating original features such as brickwork or cast-iron pipes. Tracey Neuls, whose eponymous shoe shop is in a unit at Coal Drops Yard, is among those to design their own space. The shop has exposed brickwork walls and ceilings, with industrial-looking iron storage cabinets and leather covered panels in the floor that can pop up to form additional units. Display shoes hang down from a frame on the ceiling on red fabric, allowing shoppers to see all sides of the shoe, according to Neuls. Caravane, a French interiors and fabrics brand which sits inside a double-spaced unit is designed by the shop’s co-owner and artistic director Veronique Piedeleu, alongside architect Bertrand Fairerol. The colourful store features a statement wall filled with multi-coloured cushions and has created full display rooms within the unit, filled with their products. 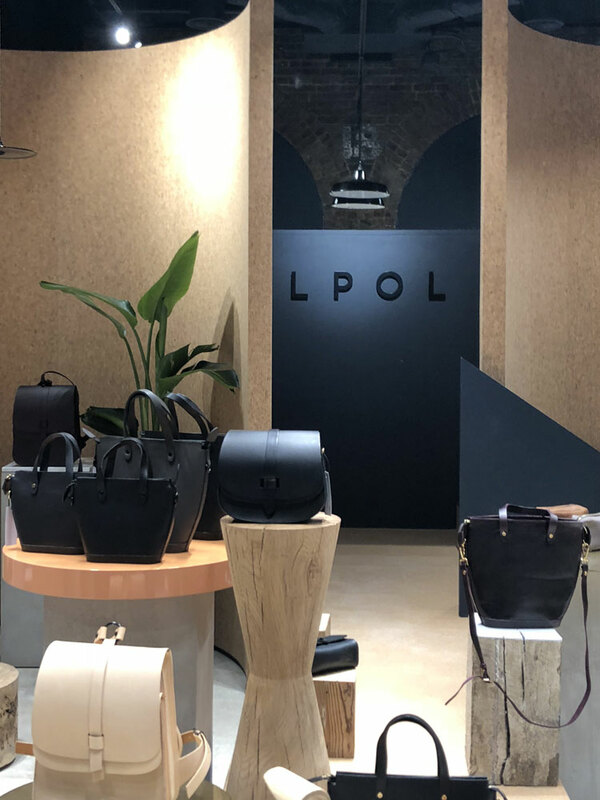 One example that fits this vision, he says, is Lost Property of London, a relatively young business that was set up by graduates from the nearby Central Saint Martins. Cos has designed its unit as both a shop and a space to display work by artists, publishing houses and wellbeing and lifestyle brands. Many of the smaller units are on Lower Stable Street, at the back of the yard, some of which will house pop-up stores. Units here include Redemption Roasters, a coffee shop that roasts its coffee in Alyesbury Prison, where it trains inmates to be baristas and help them secure short-term work contracts upon release. 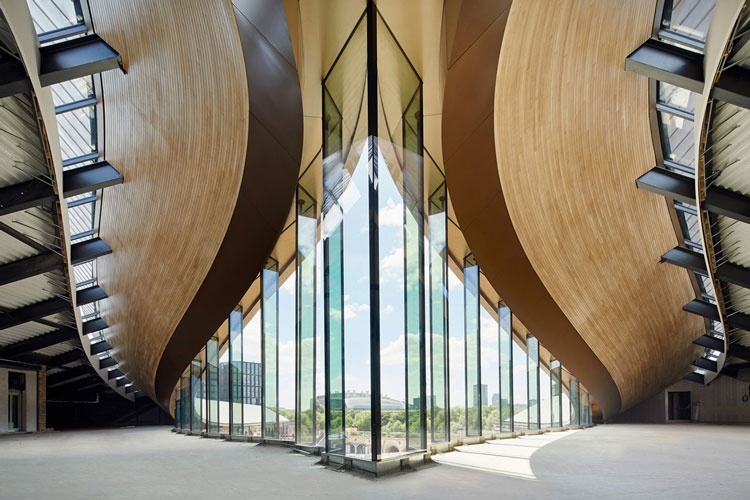 This is the first architectural project the London-based Heatherwick Studio has completed in the capital. 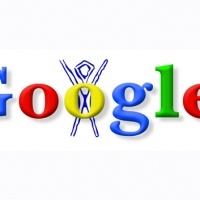 The group is also currently working on Google’s new headquarter King’s Cross.